Part 2: Extra Features: Are They Worth the Extra Money? Each thermostat is designed to work with a specific system type. There are several areas in which compatibility must be ensured or the thermostat won’t work or won’t allow you to get the best performance from your heating and air conditioning. 110V or 240V power: These are called high-voltage or line-voltage systems and include electric furnaces and electric baseboard systems. 24V power: These are called low-voltage systems and include most split and package systems with gas or oil furnaces, air conditioners, heat pumps and boilers. Millivolt power: These are gas-fired heaters that don’t use electricity because they don’t have a blower fan. Most are used for supplemental heat or space heating. Each HVAC system type requires a thermostat compatible with the power it uses. As noted, most residential heating and air conditioning systems use 24V power, and these are the thermostats we discuss in the rest of this article. However, there are different categories of 24V thermostat, and the next section discusses matching your HVAC system to the right 24V thermostat. For years, furnaces were manufactured with one operating mode. They were either on and running at full capacity or they were off. When central air conditioning was introduced, it was the same. This is known as single-stage heating and cooling, 100% capacity being the only stage. Today, single-stage furnaces, heat pumps and ACs are still produced, but there are two other performance tiers. Single-stage systems, as defined above, are made by every HVAC brand. Two-stage systems offer two stages of heating and cooling. The first stage is usually about 65% capacity, and second-stage is 100% capacity. The units run on the first stage most of the time. The advantages of lower capacity include better efficiency, quieter performance and temperatures that are more balanced. When the house cools off or warms rapidly due to changing outdoor temperatures, the system might need to run on 100% capacity for a cycle to compensate. If you change the thermostat setting by several degrees, second-stage/full-capacity heating or cooling might also be required. Every brand makes two-stage furnaces, ACs and heat pumps. Variable capacity systems operate at any percentage of capacity between about 40% and 100%. This ability takes the performance advantages of two-stage to the next level – the most efficient, quietest and most precise heating and cooling. Originally, only Carrier made variable-capacity equipment, which is also called modulating and variable-speed performance. Then, Lennox, Trane, Heil, Goodman, Armstrong and other major brands began producing it, though at this writing there are still a few that don’t. The question is, how does staged heating and cooling affect thermostat choice? The answer is that thermostats are made in single-stage, two-stage and variable-capacity models too. Single-stage thermostats: These models support single-stage operating. This means that they accommodate one wire for heating, usually labeled W or W1, and one wire for cooling, typically Y or Y1. Other wires accommodate different features such as 24V power, the fan or a common wire, briefly discussed later. Two-stage thermostats: These units have terminals to accommodate two heating wires, W1 and W2, and two AC wires, Y1 and Y2, plus power, fan, common wire and possibly additional functions such as a reversing valve for a heat pump. The thermostat uses its temperature sensor to determine if first-stage heating or cooling is sufficient to maintain the desired indoor temperature or if the second stage is required. It sends the heating or cooling signal via the appropriate wire, for example, Y1 or Y2. Variable-capacity/Communicating thermostats: These units are a different breed of the thermostat. They are called communicating thermostats, and we’ve completed a guide called HVAC System: Communicating vs Non-communicating that spells out the differences. For our purposes, it’s enough here to say that single-stage and two-stage thermostats are non-communicating while thermostats that accommodate variable-capacity systems must be communicating. Rather than having wires that give direct signals for first or second stage heating or cooling and wires for other performance features, communicating thermostats are built with just four wires: A single wire for heating, a single wire for cooling and two wires that provide power and allow the components and the thermostat to “communicate.” This means the components and temperature sensors send information to the thermostat, and the thermostat responds by controlling precisely how much heating or air conditioning is required to keep the home at the temperature desired with little variation. When replacing a thermostat, the first step is to know what heating and cooling stages your HVAC system is equipped for. Once you do, you can select a suitable replacement. 90% thermostats (especially for WIFI thermostat) in the market need a C wire to get running. If you can not find C wire in your current system, no worries. Check our recent article: What If I don’t Have a Wire to find a proper way to get C wire back. Do You Have a Communicating HVAC System? If you open the thermostat and see only four wires, you might have a communicating thermostat. Common terminal connections are one each white, yellow, green and red. That can cause confusion because the same four wire connections can also be a single-stage system. 1). Review the thermostat packaging or product description online. It will say “Works with 1 Stage heat or cool” or “Works with 2 Stage or multi-stage heat or cool.” Thermostats that support two-stage heating and cooling can be used with single-stage equipment. 2). Use the compatibility checker on the manufacturer’s website, like this one for the ecobee thermostat. 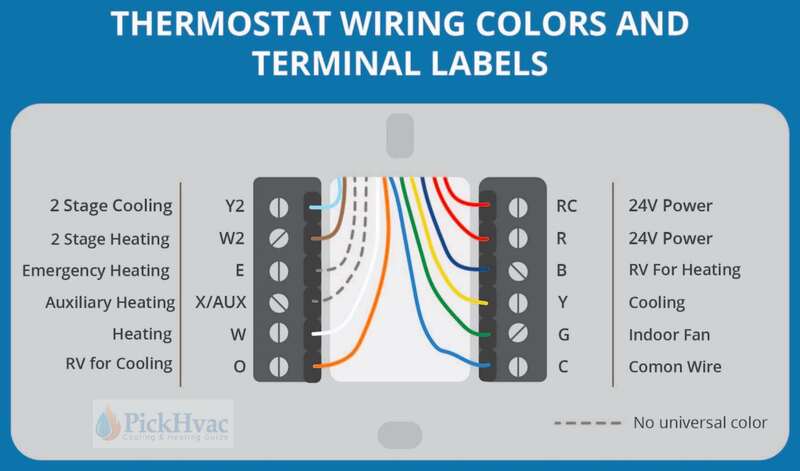 You’ll be shown a chart and asked to select the colors of the wires your current thermostat has connected to it. When you submit the information, the page will tell you whether its compatible and if you need anything additional. Note that if you have the four-wire single-stage heating and cooling setup, the compatibility checker won’t be able to determine whether it’s a single-state or communicating system. Ecobee’s site asks you to take a picture of the wiring on the thermostat and email it to Ecobee customer service for determination. 3). Buy a thermostat from a local dealer that sells and installs the brand of equipment you have. Single-stage thermostats start at less than $20; two-stage models start at about $50. The cheapest models are non-programmable with no extra features. Every time you want a change in temperature, you must manually adjust them. It’s the way thermostats have been used since their inception. However, thermostats with features add convenience and might help you reduce your heating and cooling costs. Here are the most common thermostat features with a discussion of their value. Programmable thermostats are worth the extra cost. Because digital technology has become so affordable, programmable thermostat price starts just slightly higher than non-programmable models – about $20 for single-stage programmable thermostats and $70 for two-stage programmable thermostats. When you consider that data shows savings up to 15%, the extra cost for a programmable model might be recouped in the first month. WiFi (or Wi-Fi) thermostats are programmable, but there’s an added layer of convenience and potential cost savings. You can monitor and control the thermostat using a smartphone, tablet or computer and the thermostat app. Using our sample program above, let’s say you decide to go shopping or to dinner with friends after work, and you won’t be home until 9pm. You can use the Wi-Fi/smart technology to move the change from 65 degrees to 72 degrees from 4:30 to 8:30. That’s four hours of energy savings. If similar events occur a couple times per week, the savings can add up to $10-$25 per month. WiFi or smart thermostats are worth the extra cost if you have a variable schedule. These units start at about $70 for cheap models, but dependable units cost $85 to $300 without additional features like a touchscreen display. If your schedule is very consistent, spending the extra for WiFi capability isn’t worth the money. If your schedule isn’t predictable, you might get your money’s worth from the WiFi capability. Some smart thermostats like the ecobee4 have geofencing. Download the app to your phone, and it will be tracked. When you and your phone leave your neighborhood, the HVAC system adjusts to an away setting; re-enter your neighborhood, and it adjusts to a home setting. You set your neighborhood boundaries to give the system time to heat your house in winter and cool it in summer, so you walk into a comfortable home every time. These are the costliest thermostats available when WiFi-enabled. They’re programmable, and those with WiFi capabilities show current outside temperature and conditions and give you a forecast for the next four to seven days depending on the model. Simple touchscreen thermostats without WiFi start at less than $40, and most are programmable for that price. Two-stage and communicating models cost more. WiFi-enabled touchscreen models start at about $160. Non-WiFi touchscreen thermostats are worth the money, since they cost little more than push-button models. WiFi touchscreen thermostats probably are not worth the money, since you’re mainly paying extra for weather information that is available on our phones, computers, TV and other sources. A zoned HVAC system is one that allows for independent climate control within two or more zones of your home. For example, you can send less heat to bedrooms and more heat to living areas during winter days or keep bedrooms cool for summer sleeping while allowing the heat to rise in living areas during summer nights. Zoned HVAC systems use a series of dampers in the ductwork to control the flow of heated and cooled air. Zone thermostats are a necessity if you have a zoned HVAC system. The cost of adding zone control to a heating and air conditioning system starts at about $2,000 and can cost twice that or more. Zone thermostats start at about $115 but most cost $200+. The bigger question is whether a zoned HVAC system is worth the extra $2,000-plus. They can be, if you use the zoning wisely to lower energy consumption in rooms that aren’t being used and if you plan to live in the home with the zoned system for at least five years. Here are HVAC brand’s thermostat reviews. If your current HVAC unit is the high-end model of one of below brands, you would better choose the same brand’s thermostat. Using different brand’s thermostat may lose functions (like communicating features) for high-end models. Thank you for researching your next thermostat right here on PickHVAC! Once you select a thermostat, remember to read our In-depth Thermostat Wiring Guide to help you wire it instead of asking a Pro for help. Each is OK except for a communicating one and I prefer a Honeywell wifi thermostat. I’d like to purchase a WIFI thermostat for my home and would like to know which ones offer a “cycles per hour” setting. I’m leaning towards Honeywell but noticed that not all of their units have this feature based upon owner manuals that I have downloaded. Thanks for the great writeup. I have a Carrier 2-stage AC Unit (24APA7) paired with a Nordyne FG6RA furnace. The system is controlled by a proprietary Carrier “Equipment Control Module” located next to the furnace/AC unit that is separate from the (digital) Thermidistat/Display module located in the controlling bedroom. In this setup, there are only two wires (V+ and Vg) that are routed to the thermostat location from the ECM. Given this, as I understand it, if I wanted to install a newer WiFi thermostat, such as the Ecobee or Nest, I would need to bypass the proprietary ECM and reuse the other wires running to the thermostat. If I were to do this, what would I be giving up in terms of proprietary features/operation? I know one aspect is that the Ecobee cannot handle variable blower motor speeds, but is there anything else that I should be concerned about? This is all greek to me. I’m getting an American Standard S9V2 furnace and Gold 17 AC. Will the Ecobee4 thermo work with them? Kathy — The American Standard S9V2 is a really nice furnace! The Gold 17 AC is great too. You’ll have a comfortable home and lower energy bills. To your question, yes. The Ecobee4 will work with them. I have a Lennox 2 stage with variable speed furnace, but I am finding it impossible to find out which WiFi thermostats that work with variable speed motor. I found out the hard way buying a Nest. Had a Carrier thermostat TP-PAC-04SI installed in 2012 w/furnace. Specific price was not quoted for Thermostat. It needed to be replaced. Need Price of Carrier thermostat TP-PAC-04SI in order to confirm the equivalent (SENSI 1F87U-42WF) is now installed. Is this an equivalent in price & options & features ?